Gnaw Their Tongues and Crowhurst are both one man projects. The former is from the Netherlands and the latter is from the US. Both specialise in experimental/black metal music, and they have collaborated for this release. Individually I really enjoy both of these artists, (Genocidal Majesty, Crowhurst, II), so I was quite excited when I found out that they have worked together for this release. Before we properly get going, I also want to briefly mention the stunning album artwork. It’s a striking and arresting piece. Containing four tracks with a total duration of 36 minutes, this is a punishing, lethal concoction of noise, electronics, experimental sounds, dark ambient, industrial, and the most virulent of black metal. Shaken and stirred until ready to burn through the world, this is a nightmare soundscape of experimental mayhem, the likes of which works holistically much better than my above description might imply from all of its disparate parts. Nothing’s Sacred is the opening offensive, and is nine minutes of harsh noise and electronics. With an undercurrent of humming evil and maintained tension, the track unfolds with a scraping quality, as if it doesn’t want to be heard at all. After that we get the blistering evil of Speared Martyrs; it starts with a gentle percussion that suddenly explodes into raw, ugly black metal. This is a blackened noise track that wilfully rips and tears, where Nothing’s Sacred reluctantly scraped and scratched. Closing with an industrial beat that would make Godflesh proud, this is a strong track all-round. The Blinding Fury of Suffering is the shortest song here. Sounding like something malevolent is trying to claw into our world from beyond the void, the song is a crawling, malignant piece of work. Off-kilter industrialised beats form a backdrop behind a layer of thick, spiky noise, while a daemonic entity screams out in pain and desire. Terrifying. The final track on this harrowing album is the 15-minute monster that is The Divinity of Our Great Perversions. This opens as a blackened doom monolith, before abruptly changing tack to a punk-charged black metal assault that’s both vicious and quite traditional compared to the rest of the material on this album. Punishing and brutal, there’s an industrial metal quality to this that reminds me of old Strapping Young Lad and Ministry in places. This then morphs into a slower, doomier, and quite atmospheric proposition, with a strong feeling of electronic grandeur, before returning to fiery blackened fury. We then get harsh noise and grim screams, before the music once more explodes with venom and destructive malice. It ends with doom, which I find somehow fitting. It’s an epic track, and the crowning achievement of a quality and worthwhile collaboration. One of the reasons that the music here succeeds with its unconventional structuring is by never overly emphasising one particular aspect of its makeup for too long, while also simultaneously delivering an intuitive flow in its construction. The songs have been well-crafted by two consummate artists that know their trade like only experts can. 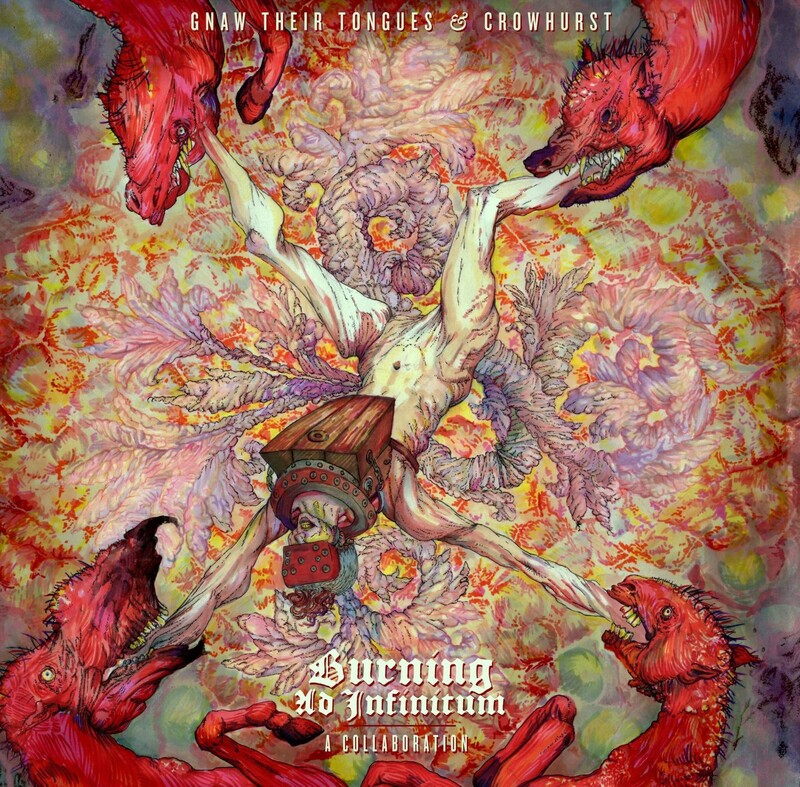 Burning Ad Infinitum: A Collaboration is a wonderfully nasty and unfriendly listen, one which any fan of challenging music should be able to get to grips with. Great rewards lurk in its poisonous soundscapes. This entry was posted in Black metal and tagged Black metal, Blackened Doom, Crowhurst, Dark Ambient, Electronics, Experimental, Gnaw Their Tongues, Gnaw Their Tongues & Crowhurst, Godflesh, Industrial, Industrial Metal, Ministry, Noise, Punk, Strapping Young Lad. Bookmark the permalink.